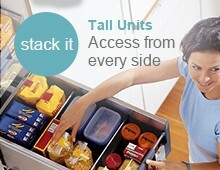 Blum Tandembox inner drawers for positioning behind a base cupboard full height door. 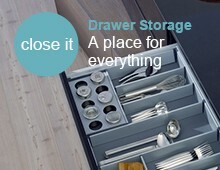 Tandembox drawers feature Blum renowned soft close runners combined with its distinctive drawer profile. The components are colour coordinated with the supplied twinwall boxsides. No need to change or move your hinges with these internal drawer sets. 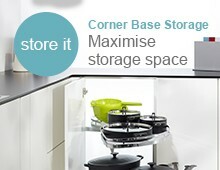 You can install your drawers in the same location as your existing hinges, if necessary. We reduce the drawer’s width by 25mm. 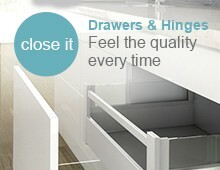 Spacer blocks are provided which fit behind the hinge side runners, allowing the drawers to clear your hinges. Please note, you will only be able to access the drawer contents from two sides, not three. 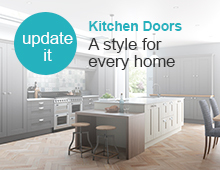 *Please check your existing cabinet hinges are not 170 degree opening hinges, as these protrude into the cabinet approximately 60mm, when the door is closed. 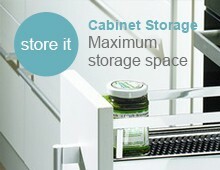 Required minimum cabinet size for installation: 720mm high and 455mm deep. Blum Lifetime warranty card - Find out more..
All sets are designed for the external cabinet width size i.e a 500mm drawer will suit a 500mm external sized unit. Please note: use in conjunction with cabinet sides constructed of 18mm thick material. Bespoke drawer manufacture service for alternative depth and widths also available.